A long time has passed since I last wrote a post. I have been thinking , reading and playing CC. I thank you all the readers who have continued reading the different posts. So this post will be a recollection of readings, ideas, opinions. I have read that some critics believe Fischer never faced the strong opposition Soviet players faced in Soviet/world tournaments (we should remember some of the gruelling events held in the now defunct Soviet Union). (I must admit I have thought about this matter some time ago. It is very easy: make a comparison between the events Fischer took part in and the different tournaments players like Spassky, Korchnoi, Geller, Tal, Smyslov ,Keres ,etc. had to play in the same period of time. Could any US Chess Championship be compared to any USSR Chess Championsip of the same period? The answer is in the negative, in my opinion). Today, every CC player has a computer at home. Some people do not use a chessboard + pieces any longer… They see the position on their screens, analyse, check the moves and send the them. 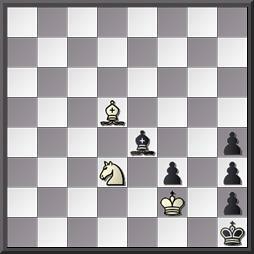 No chessboard required.. Is this good or bad?. I must confess I have done it a lot of times… BUT: I keep buying brand new chess pieces because from time to time I like to make a review of all my games (I am playing over 100 CC games at the moment) using chessboard and pieces to understand the positions. So, my advice to you would be as follows: in many instances,you will receive your moves, analyse them, check them out with a program and sent your move. But it would be better for you to set up the board and chessmen and make an analysis of every game you have in play. If you are wondering how it is possible for me to have over 100 games in play, my answer would be because I love playing CC. CC is not a money-making activity and it has always been a sort of therapy to me. 2015 has been terrible to me, so I am trying to use CC as a therapy. It compels me to open my e-mail page, my ICCF page, take down the move and find an answer to it. As for training, let me recommend you to keep on solving 3-movers or 4-movers. (I have read Lasker used this system too.) So here I am going to leave some homework to you. 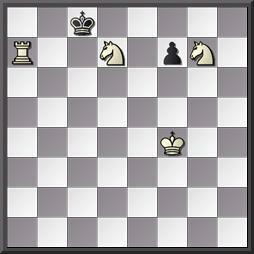 And thank you very much for being there..
Mate in 3 moves. H.M. Prideaux. Those who play CC will recognize it immediately. As White: 1) You decide to play your chosen first move in all the games. O.K. 2) You decide to play your favourite first move (1. e4) against the players with a similar ELO as yours but to be a bit conservative against those with a higher rating (1.d4 or 1.c4) . QUESTION: Are 1. e4-players more leaned to shift to 1. d4 than 1.d4-players to shift to 1. e4?? QUESTION : Do you have full confidence in your defences or do you choose them according to rating factors?? Chessplayers are a curious lot… Have you ever try to understand why you decide to do what you decide to do? QUESTION : If you are a CC player and use programs to check your moves, do you think that this way of acting changes the way you play OTB Chess?. The question is relevant because in CC you always try to find the absolutely best move and you never expect your opponent to make a mistake. So you get used to expect “always” the absolutely best opening line from your opponent and the absolutely best reply to your moves: factors like being short of time , tiredness or speculative play are ruled out, since the program will always give you the refutation to speculative play and, in a 99.99% of cases, you and your opponents have plenty of time for every move. QUESTION: If you are a CC player, have you ever reach the conclusions that the more CC games you play the less you understand how Chess is played and that you would find it impossible to teach somebody to play Chess? QUESTION: The more CC games you play the more questions you pose to yourself or the more answers you get from doing it? QUESTION: Do you think Chess exerts a deep influence in the way you see life? QUESTION: Do you think Chess builds your character and personality or otherwise it “shows” them? QUESTION: The “Big One” : Could you live without playing Chess??? “What we cannot speak about, we must pass over in silence” Wittgenstein. I have been writing in this blog for many months. Now I am in a stand-still because I have fallen in a curious state: I think I cannot write about Chess. Firstly, I am not a professional OTB player. I’m , simply, a CC one. Secondly, perhaps I could tell my own experiences, but nothing more. Even top professional GMs have problems with trying to write about the game. I suppose Chess is so vast a world that it cannot be taught. It can only be learnt. In my writings I have tried to show that CC and OTB Chess are very different, and this implies different ways of training and studying Chess. (One single fact: for an OTB player memorizing opening lines is vital. Not for a CC player, who has databases to look up during the game. So, as time has been passing by, I tend to think perhaps wrongly- that I hardly know opening lines… (or am I being too self-critical?). In any case , CC players can vary their opening repertoires as much as they desire because they do not need to commit to their memories tons of opening variations. The present state of Chess theory is overwhelming. It is nearly impossible to know everything about several different lines. Only professional players can try to keep all the Najdorf lines, all the Ruy Lopez and another system as Black against 1.d4 in their minds. In CC this problem is relative: you play the opening with your databases, so in the same tournament you could be playing two Najdorf, two Spanish , two Italian, one QGA, three Nimzoindian one Benoni and two Queen’s Indian openings/defences without fearing to forget / change moves or not knowing entire subvariations… And in another tournament perhaps at the same time, you decide to play the English as White and the Grünfeld as Black…In a sense the challenge is (to me ) absolutely attractive. CC is the continuation of the eternal game but with other means at our disposal. I don’t know if possible CC players reading this blog agree with this (of course you may be the type of CC player with a fixed opening repertoire . Then your situation is a bit different. But I guess most average CC players like changing the openings they use for the sake of exploring new alternatives, play different positions -more aggressive/more strategical, etc- because they have everything and everything updated in their databases.) To put it in a nutshell: you don’t need to memorize opening lines to play CC now. As for the CC players’ approach (I’m thinking of the ICCF), today nobody plays for fun (and this is great, in my opinion). Nobody spends time and money to play in the ICCF simply for fun, for making new friends and so on. People are out for blood. They play to win because victories give you rating points and the possibility of reaching norms. The use of computers have turned CC into an extremely specialised matter. The ICCF outstanding webserver have nearly finished with the old practice of postcards + stamps (the costs have been drastically reduced and everything is under control with no possibilities of moves going astray in the post, expensive registered letters, misunderstandings, etc.). So people play out their games till a result is nearly unavoidable. These days I have also been thinking about the players who have most influenced me. A trip down memory lane. This has led me to try to understand how I play Chess and which my most important defects are. When I began to study Chess my first books/influences were Karpov, Nimzowitsch, Petrosian, Reti and Botvinnik. So I was influenced by strategical/positional players rather than by tactical ones. (Everybody says you must start learning tactics, combinations, etc. I began the other way round: by trying to understand Petrosian’s and Karpov’s positional games, Nimzowitsch elaborated -sometimes tangled- expressions…) Curiously enough, this has had a consequence affecting my character: that chessic influences have affected my life outside Chess. I tend to analyse, see or understand everything from a sort of strategical point of view, trying to solve all the matters in life in a strategically planned way (forgive me but it is easier to understand it than to express the idea with words. I hope you understand what I mean). And here I am: re-reading Chess books, thinking about how to improve my play and in a terrible contradiction. After all, who am I to write about Chess? The Internet is full of Chess blogs written by GMs. You can buy those wonderful books by M. Dvoretsky, J. Nunn, J. Rowson, J Aagaard, A. Soltis, J. Timman, etc. This blog began to be written in February 2012. When I am writing these words (end of August 2014 )it has had well over 6,300 visits. I am very grateful to all the people who have spent their time having a look at it. A.W. Galitzky. 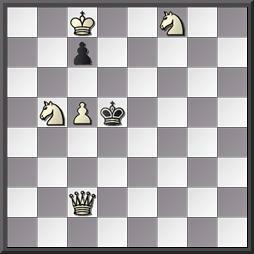 Mate in 3 moves.